Learn more about the Lorex Home Security System with 4 Cameras and Night Vision with pricing, features, and FAQs. 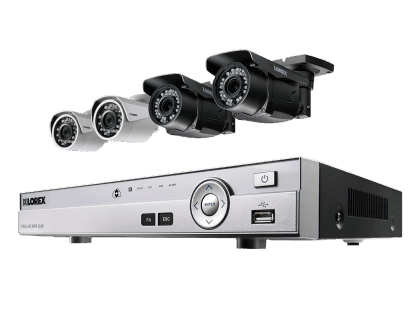 The Lorex Home Security System with 4 Cameras and Night Vision is a 1080p HD security monitoring system, that comes with a Lorex DV700 8-channel DVR, and four all-weather HD bullet security cameras, all equipped with night vision and motorized optical zoom lenses. 4 HD 1080p (including 2 varifocal) cameras. 170 ft. night vision range. Pros: Easy to install. Footage is clear and sharp. Mobile app works well. Cons: Processing and shipping takes a long time. DVR is noisy. Video interface difficult to learn. Bottomline: The system is user-friendly and has excellent features. The cameras are robust, and of a much better quality than the standard. What are some Lorex Home Security System with 4 Cameras and Night Vision alternatives? Where can I buy the Lorex Home Security System with 4 Cameras and Night Vision security camera system? The Lorex Home Security System with 4 Cameras and Night Vision is available on Amazon and on the Lorex website. How well does the Lorex Home Security System with 4 Cameras and Night Vision perform in darkness? The two LBV2711B 1080p HD Bullet Security Cameras have a night vision range of up to 130 ft. in low light, and 90 ft. in complete darkness. The two LBV2723B High Definition Security Cameras have a night vision range of up to 170 ft. in low light and 115 ft. in complete darkness. Can the Lorex Home Security System with 4 Cameras and Night Vision be used in any weather? Yes, the cameras can operate in heat up to 140 degrees, and cold as low as -22 degrees. They are also completely dust resistant and can withstand low-pressure jets of water from all directions without the water penetrating to the circuitry.